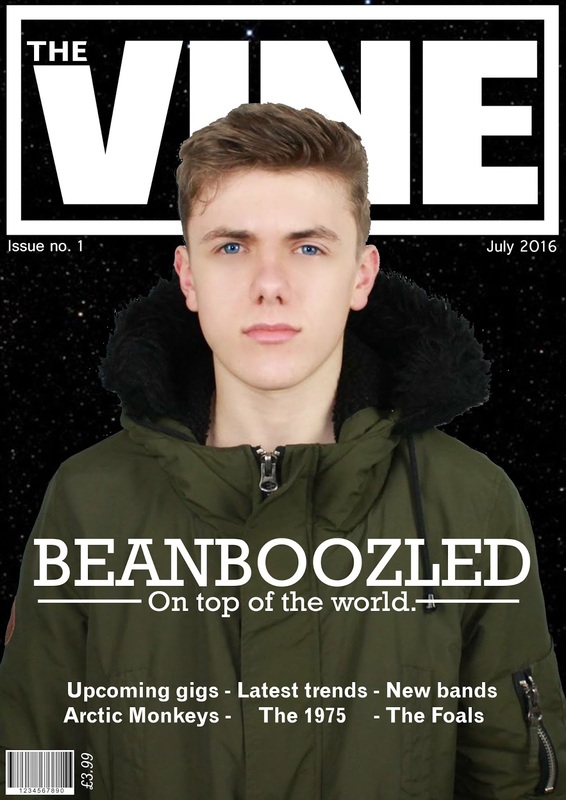 For the masthead of my magazine 'The Vine' I used the font Hattenschweiller which is already on the school computers. The font is very big and bold so that it captures the interest of potential readers, this convention is used very often with all magazines seen in shops. 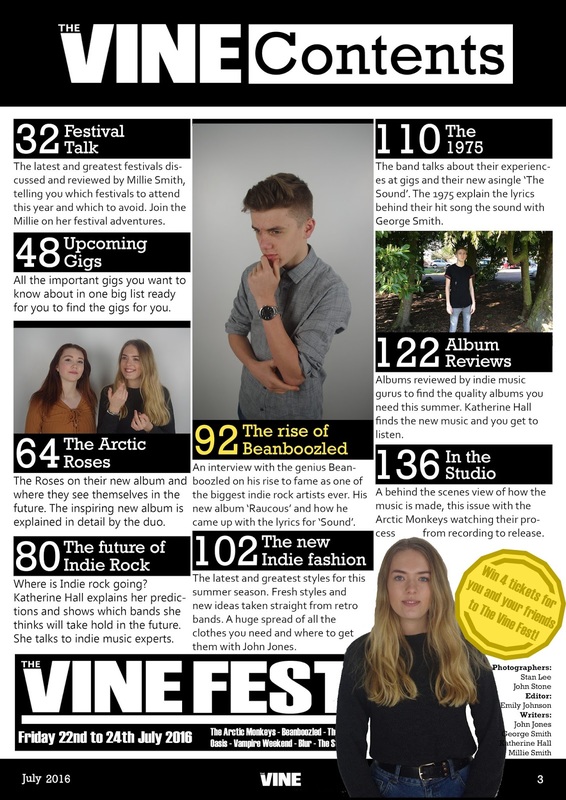 I chose to use the name "The Vine" because of a number of reasons firstly it is linked to the saying 'I heard it through the grape vine' meaning to hear something from someone that has been passed from person to person by word of mouth which could be confidential or secret, The Vine passes information about small indie bands and artists which justifies the name. The second reason is because grape vines have many grapes on them just as 'The Vine' has many different articles and different pieces of information. My target audience like to find new indie bands and artists so the name felt apt for them. My masthead is similar to magazines such as 'NME', 'The Fly' and 'Vibe' which are all also very big and bold and catch the eye of the consumer. My masthead is the second most obvious object on the page behind the main picture of the artist. I chose to make my magazine very simple to cater for my target audience who tend to like a minimalist look. The graphology of my front cover is extremely simple. I only used three fonts one for the masthead; one for the subtitles and one for any other text. The fonts I use are Hattenschweiller, Rockwell and ________ they are all very simple but on a varying scale. The masthead font is very simple and bold; the subtitle font (Rockwell) is a serif font so is slightly more interesting and draws the eye of the reader; Finally I use the ________ font because it is a simple sans serif font that the reader will read after the masthead and subheadings. I used white for all my text on the cover because the background is black, this contrast makes the text pop out on the page which catches the eye of the reader. All of the information the reader needs to know is placed well and in white so that they can see it such as price, date and issue number. Next I placed the other information the reader needs to know, a brief show of the contents. This is placed towards the bottom of the page in a simple font that is practical and easy to read. This is so the consumer can see at a glance what is in the magazine, the artist's names on the front can attract people. The picture of the subject is placed centrally above the masthead but behind the subtitles. This is because the picture needs to be as big and as interesting as possible to gain the attention of readers. The pictures taken in my magazine have a specific look to attract the target audience. The costumes used are relatively indie, the subject is wearing a knitted jumper and basic dark blue skinny jeans with a silver watch. 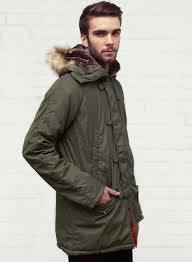 These items of clothing would be considered indie and attract the target audience because they could either already dress like that or aspire to. On the cover page the subject 'Beanboozled' is wearing green parka coat which is considered indie. The subject's haircut is also specifically chosen because the swept back top and short sides is currently in fashion. The artists clothes are always very simple and make the reader concentrate on his face more than the costume, this is so they remember how his face looks. The colours the model wore are quite dark which contrasts the white text especially on the front cover as well as making the model pop out on the double page spread because the background is white. The camera work and framing of the images is relatively simple. The cover page image is a mid shot of the model with eye contact, this creates an intense image which can catch the eye of the reader by looking into the subjects eyes which have been captured well because there was good lighting when the picture was take so the colour is really brought out in his eyes. The double page spread's main picture does not have eye contact because it did not need to pull in the reader in the same way a cover would need to gain the attention of potential buyers however it still has to be interesting. The shot is a slightly further back mid shot shows the model's legs as well as his torso, this is to show more of his clothing which is interesting to some readers making the magazine cater for a few different readers. 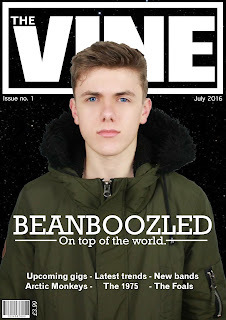 The title of my magazine is the name of the artist 'Beanboozled' this is a convention I am using because a lot of magazines do this with famous artists names to gain the attention of the potential reader/buyer. 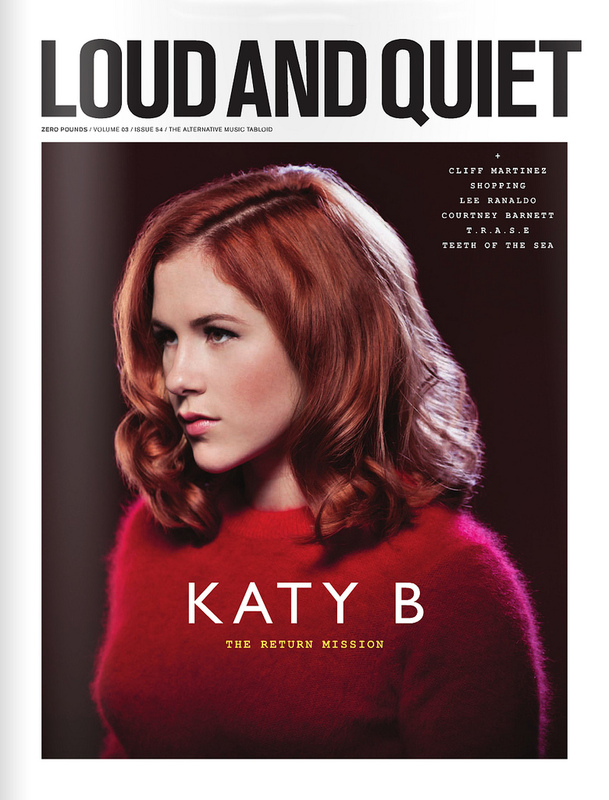 Examples of the use of artists names to get attention are everywhere for example I have taken the front cover of 'Loud and Quiet' magazine, as you can see it uses Katy B's name in a big font to get attention. I used the Rockwell font because it stands out and is interesting which again will gain the attention of the reader. The article seen above was published by 'Q' and I decided to use the large watermark letter in my double page spread, I also tried to copy the way the picture is but I left too much white space around the subject making the page look empty. Next time I would zoom into the subject more. The header I used challenges convention because it curves with the B. The fonts I used varied Rockwell is quite fancy and good for titles however it is hard to read if it was to be used for articles so I used a simple font for the paragraphs this is using a convention. 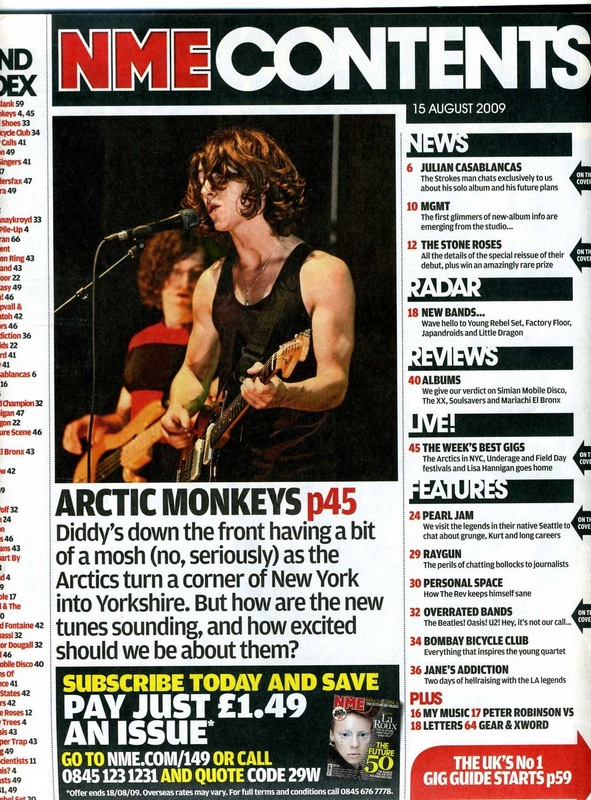 The genre is Indie/alternative this is shown in a lot of ways in my magazine. For a start the simple cover page only uses white for the text and only has limited text, this is because I am aiming for an audience that enjoy simplistic stylish magazine covers. 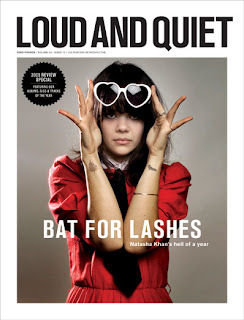 Other magazines in the same genre such as Loud and Quiet and The Fly use the same style. My contents page fits the indie genre by mostly using black and white apart from the pieces I really want the reader to look at first. 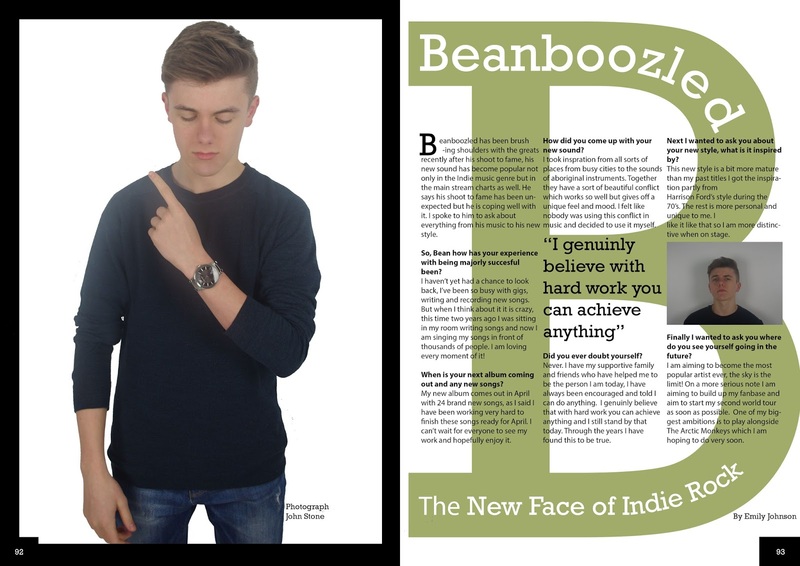 The artists in my magazine are represented in different ways, Beanboozled (the main artist) is seen in his pictures as very confident because of his image he is trying to portray. The way the model is stood and his general body language indicates the confidents. Beanboozled's portrayal matches how bands such as the Arctic Monkeys are portrayed, in quite a serious light. However The 'Arctic Roses' are portrayed more naturally and in a slightly 'weird' way so they are more relatable and seem like normal people to the reader, which challenges convention in most cases. Magazines have used this technique but it's rarer than the serious look. The colour scheme I decided to go with was nearly completely black and white because this fits the genre of indie music and the target market enjoy this style of simplicity. 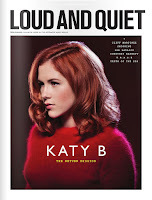 This colour scheme develops the convention of indie/alternative music magazines for example Loud and Quiet uses this simple colour scheme. I chose to use yellow on the contents page so readers would naturally go to the yellow parts first which are the most important. Finally I made the double page spread black and white with a green 'B' for Beanboozled, I did this because the page was too dull and needed some colour to make it more interesting for the reader. Charles, this is a reasonably detailed response and shows an understanding of the conventions of real media texts. You would be well advised to tweak this response to include the key words from the question (USE, DEVELOP and CHALLENGE) to ensure the examiner can see that you focus is clearly on the task set.